In 2017, thousands of OG Rusto Caps were passed over for newer, more popular styles... Did you know... that these SPECTACULAR caps are a fundamental part of graff history? (Cue Sarah Mclachlan playing Angel ) Did you know... most writers have forgotten their once favorite cap? This year, we ask you to join us in unlocking the magic and reviving a classic with our new SAVE THE RUSTO Pack. When you purchase our SAVE THE RUSTO Pack, you're providing a home for the following: 10 OG Rustos 10 NY Fats 1 Yellow Sekt Adapter 1 Pink Sekt Adapter Act now and we will even include an ART PRIMO Boxcutter with your order- perfect for modifying caps as you see fit. This limited time offer is value priced at $7.99. You'll save money and sleep easy knowing you joined forces with AP and Green Ranger to save these timeless accessories. From all of us, thank you. In 2017, thousands of OG Rusto Caps were passed over for newer, more popular styles... Did you know... that these SPECTACULAR caps are a fundamental part of graff history? (Cue Sarah Mclachlan playing "Angel") Did you know... most writers have forgotten their once favorite cap? This year, we ask you to join us in unlocking the magic and reviving a classic with our new SAVE THE RUSTO Pack. 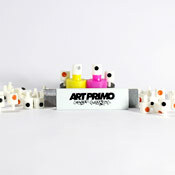 Act now and we will even include an ART PRIMO Boxcutter with your order- perfect for modifying caps as you see fit. This limited time offer is value priced at $7.99. You'll save money and sleep easy knowing you joined forces with AP and Green Ranger to save these timeless accessories. From all of us, thank you. This product was added to our catalog on Wednesday December 12, 2018.